Each day our children have many thoughts and experiences that reach their senses of sight, sound, smell, taste and touch. These thoughts become a form of language at their fingertips and with a little guidance they can transform their language into writing and capture these moments forever in print. 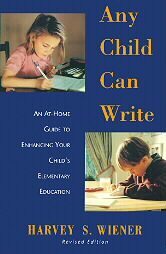 "Writing is a magical realm of expression that allows your child to come to terms with the joys and pains of daily living" quote by Harvey S. Wiener in his book Any Child Can Write. This quote made me realize how many events and thoughts may go unnoticed in my childrens life. I realize that it is up to me to encourage my children to put their thoughts on paper. My daughter Samantha, age 11, loves animals and continues to keep a daily journal where she writes the events of each day. Whether we had a challenging day or a day of delight, she puts her pen to paper and enjoys recording her days events each evening. Some days have been sad, like the day her mother hamster destroyed one of her babies. Others have been joyful, like the day our goat "Reeses" gave birth to twins. It is a consoling thought for me to know she has recorded those events and will be able to return to them in the future and recall those precious moments. I have just started this routine with my youngest daughter Sarah, age 5. Each evening we write two or three sentences about what we did that day. I than read a devotional while Sarah "writes" in her journal by drawing a picture of something that occurred that day. It is something we both look forward to each evening. Your childrens writing journey can bring today. Here are some simple writing activities that may help spark interest and creativity in your child. LISTS - provide excellent practice for any age group. I normally begin with a list every week and jot down my goals for the week, phone calls to make, errands to run and items to purchase. Your child can help you with your list or create their own. If you have birthday parties for your children, they can prepare the guest list, menu and games to be played. If they are visiting their grandparents or friends, they can start a list of toys or other items they may wish to bring with them. How about a list book? A list book can include weekly menus, things to do on a rainy day or chores. The ideas are endless. A list book would also be an ideal book for your child to learn to become organized. It can continue for a lifetime and can keep records of such things as; clothes to buy, books they've read or wish to read, money they've earned, and friends phone numbers and addresses. List writing is a very stress free and easy activity to incorporate into a daily schedule. SIGNS - are another great way to exercise writing. How about a decorative sign for their bedroom door? A personal chore list would remind children of their daily responsibilities. If you are teaching a new language you can help your child make small signs and place them on objects around your house. This can also be done with new words they are learning to read or spell. PICTURE WRITING - drawings are a fun and non-threatening way to begin writing. You may begin by simply encouraging your children to draw from a story they have just read, a place you've just visited, or to simply draw their pets or favorite animals. Using unlined paper for the drawing and than having them write a few words or sentences on a sepreate sheet or on the back to explain who or what they have drawn. This can also be the start of story writing. Keeping their work in a folder or adding them to a three ring binder makes it easy to view by family and friends and for them to see their achievement. With picture writing you can also create your very own art gallery. What a delight for a child to see others enjoy his creations! Do you need some structure? "DRAW WRITE NOW" is a fun and interactive curriculum that I have been using with my children. It contains themed activities that can be done around holidays or school lessons. NOTE & LETTER WRITING - I have always enjoyed writing a short note to thank a friend for their prayers or a gift. A handwritten note to grandparents, uncles, aunts, siblings or friends can be a fun way for your child to express their thanks or share exciting news. Letter writing can be done by older children, as it tends to contain more information. Both letter and note writing can contain a salutation, content, closing and a signature. This activity can be a great reinforcement to English and spelling lessons. POSTCARDS - when you are away on a trip sending an inexpensive postcard to a friend could be an exciting exchange of information for your child to participate in. A brief note of how your trip is going can be an easy activity that your child would enjoy. From choosing the postcard and than with some help, deciding what to write, adding a stamp and making a visit to a mailbox or hotel counter can be a memorable venture in itself. You may wish to plan ahead and purchase some post card stamps. CHALKBOARD - can be a great location for a daily exchange of notes between you and your child. A bible verse, famous quote or thought for the day could be a wonderful way for your child to begin their day. AUTOBIOGRAPHY - older children may wish to begin a story of their lives. What they do, where they go and who they share their lives with. Who knows, you may have a famous writer in your very own home! When young children begin writing, lots of patience is needed. You may need to spell words out when they are unsure of the correct spelling. With older students you may need to encourage use of the dictionary and thesaurus. When children use words daily, a reserve of language is built in which they can later use to transfer thoughts onto paper. They can record feelings and life events through writing. A child who watches us as we do chores, talk on the phone and handle daily challenges, who hears the rumble of thunder, or rain hitting the pavement, smells a cake baking or breathes in the scent of pine, is a writer waiting to grow. That is your child! Our goal should be to establish a positive attitude towards writing. Your advantage as a parent and a teacher is that you can adore the intent and ignore the mistakes while taking advantage of some praise and hugging time. E-mail us your thoughts or suggestions about this site. Many homeschool families have acquired the habit of writing far better than I have. However, if you haven't already started, I want to encourage you, to encourage your children, to begin their writing journey. On the links that will follow in days to come, I will share some of the information I have discovered. I may possibly even include some ideas from other homeschool parents. My desire is that your family will greatly benefit from it. Click on the links below to help your children develop the writing habit.